Step outside. Feel the crisp air and sun on your cheeks. Look around. Flower bulbs are starting to bloom and leaves are unfurling, announcing that spring is near. Listen closely. Beyond the bird song you might hear the bleating of baby goats. 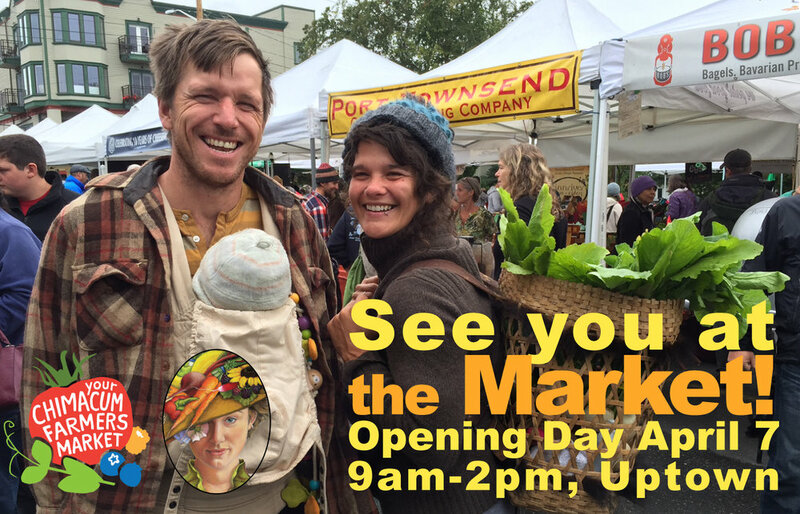 They are getting excited for the Opening Day of the Port Townsend Farmers Market. 9:10am, goat parade with baby goats from Harmonyâ€™s Way and Mystery Bay Farms. Come in animal costumes for a chance to win a $20 Flora Market token. JCFM warmly welcomes new vendors to Market this season. In addition to the Marketâ€™s returning farm, artisan food and arts vendors, a total of nine new vendors will join the Port Townsend Saturday Farmers Market this year. Some of these vendors plan to be at Market for Opening Day while others will attend later in the season. New vendors this season include: BluJay llc, Carnahan Woodworks, Diamond Day Bouquet, Duckabush Mushrooms, Heartwood Center for Spiritual Pursuits, Johnson & Gunstone Shellfish, artist Lindsey Wayland, Port Townsend Vineyards, and Who Sells the Chicken Eggs. Some of the products these vendors will be bringing to market include: kombucha, Northern Thai sausage, cultivated and foraged mushrooms, shellfish, and new arts and crafts to market. Like other JCFM vendors, new Market businesses share a commitment to sustainable practices and sourcing. We are pleased to thank our new and returning market sponsors. Market sponsors help JCFM offer food assistance matching funds to low-income shoppers using SNAP/EBT and WIC/Senior Farmers Market Nutrition Program vouchers. Our sponsors also help us offer new programs like our Power of Produce (POP) Club and fruit and vegtable prescription program (VegRx). I will share more about these in future newsletters. Last but not least, our sponsors help us supplement our operations budget so we can keep vendor fees low to incubate new and growing local farms and small market businesses. Our 2018 sponsor include: Jefferson Healthcare, the First Federal Community Foundation, 1st Security Bank, Kristin Manwaring Insurance, the Port Townsend Food Co-op, the Port Townsend Arts Commission, Gaiaceous Gardens, Port Townsend Chiropractic, Port Ludlow Resort, Organic Valley, the Port Townsend Windermere Real Estate, Kitsap Bank, Kitsap Credit Union, the Rose Theatre, the Starlight Room, Ravenscroft Inn, Blue Heron Construction, Peninsula Credit Union, Fountain Chiropractic, and the Chimacum Corner Farmstand. We also have partnerships with Jefferson County's 5210 campaign, and, new this year, with Jefferson Transit. Our deep gratitude goes out to each of these sponsors and partners as well as to our individual donors, market members, and to you for your support of local farms, food and art. Thank you!